The accommodation was wonderful and comfortable and the place is very cool and clean and the area is quiet and beautiful. Excellent service and staff members very friendly and helpful. The size of the house was amazing, bedrooms large enough and plenty of space for the family gathering, as well as the pool and game room. Beautiful unit in a prime location nicely furnished. Loved our recent stay, from the easy instructions provided prior to arrival we were able to check in very easily. The unit is so beautifully decorated and very spacious. Loved how quiet it was and very relaxing. Also loved how close to a pool it was, within walking distance. This property is breathtaking! There are amenities for every individual in the family to enjoy. The master bedrooms get a bit warm at night because there are no ceiling fans in them but they are beautiful along with their exquisite and spacious bathrooms. Overall I enjoyed my stay and I will book again for next summer! I have enjoyed my stays with Reunion - last year I booked the vacation house and was just blown away by the property. My in laws booked the year before. The property is close to everything - just a short drive away. If someone is wanting to stay and enjoy the property there is plenty to do. If your need is for a large home or small they have and to suit any budget. Amazing House! Great Stay and will do it again! Overall Excellent Stay!! The staff was exceptionally professional and helpful. And the view of the Reunion neighborhoods was like PARADISE!!! The home itself was clean and extravagant. My family and I really enjoyed our stay! 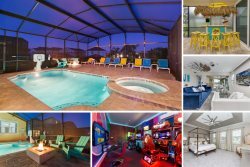 Very pleasant experience with pool, billiards, game room, very comfortable beds! We had a wonderful experience at reunion and definitely will come back! Will also highly recommend reunion to everyone! Thank you for making us feel welcomed and feeling like home! Very happy and satisfied! Its a lot more efficient then hotels. Loved the privacy and that it had everything under one roof! Reunion Vacation Homes' property was amazing! My children enjoyed every moment and there were no arguments over TV or game time as every age had their own space! The property is beautiful and everything was perfect for me and my family. Overall we had a great stay! Enjoyed our stay very much! The house was huge and perfect for a large family. Of all the places we saw with rental homes- Reunion Resort was the most beautiful. The golf course is absolutely beautiful. The entire resort was beyond our families expectations! Staff was very attentive and the house was perfect for our family of 7. Check-in was super easy! We were given a code for the door which made it easy for all of our family. The young adults lived the game room!! Reunion Resort is a wonderful and safe place! We love it here and Reunion Vacation Homes is great! The home was big and beautiful. We loved the pool as well! Overall great time and we would recommend! From looking at the pictures on line and actually seeing the house it exceeded my expectations. The home was big, spacious and everything was up-to-date! Great service, good location and stunning property! Very clean and the pictures did not do justice to the size of the place! The staff was very professional and the communication was perfect. First class service from start to finish. We would definitely use Reunion Vacation Homes again when returning to Orlando! The number of bedrooms was great for our large family. Themed rooms were enjoyed by the young kids. Outside and pool area were great. We loved the property! This was one of our best family vacations due to the size and comfort of the property. The ability to cook meals and the close proximity to the theme parks was a plus. We enjoyed being in a new house that was well designed and decorated. The rental process was easy and everyone was helpful when answering questions. The website was very helpful! Having pictures of the property is important when you are deciding on a property. Amazing home with lots to love! Felix and James were very helpful and professional in assisting us with an issue and we believe their customer service shows that Reunion is truly concerned with their customers enjoying a quality vacation. The outdoor pool and splash pad was great for the kids! I stayed twice in Reunion and I loved the peace and quiet, the beautiful landscapes and the accommodations!